Contents: This very special edition two-CD set was made for the 1998 GatchaCon and given away as a prize on the last day. It contained a rare Gatchaman radio special that was done to promote the OAV series release. It was hosted by Rika Matsumoto, the voice of Jinpei in the OAVs. Additionally, it included interviews with the rest of the main OAV cast and some of the staff. Mono. 3. 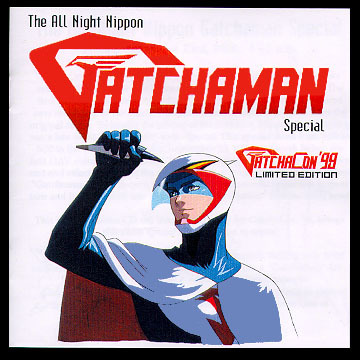 Campaign Song, "Gatchaman '94." 6. Street Interviews / "Story Digest."